names. A high standard domain name is very many essentials for a rapid business growth so many people are looking for standard domains. In that case people who provide domain or hosting services can be in profit. There are many hosting companies which provide the unlimited domain services to its clients so buy such hosting which provide you the unlimited hosting service and think for the best domain name that may be used by other and reserve it so that whenever people look for that domain they need to come to you to buy it. 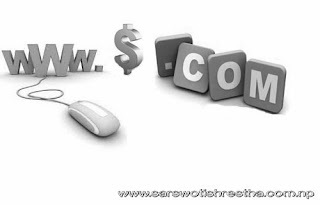 There are many news that people buy the domains for more than $2000-50,000. This business is incredible. Step 1: Buy some domain that may be worthy to others and put them in online market. There are many sites that may help you like Flippa, you can sell your domain in Flippa. Similarly there are many third company sites that ask for help but never give you a penny so beware of such sites. If you have a website or blog then you can put some ads of your domain. The task here is to choose suitable domain names that may be valuable to others. Step 2: If you find some domains already reserved by others but can worth much more to you then negotiate with the people owning that domain and buy it now you can sell it on double price so that you can get much more profit. This depends on your niche so better to do some keyword research and also find what kind to websites is increasing at your area. Step 3: Put your domain names in auction sites. Look forward in the Google and you will find many such sites that provide service of auctioning your domain names. Step 4: Price of your domain matters the most. Make the price highly negotiable and make sure that your buyers may not think it bad to have deal. If you want to look professional then make your own portfolio and advertise your domains there. Step 5: Right domain name is the most important thing to consider. If you do not have proper domain name selection then your business will fail so do some research and put suitable domain names. Buy domain names like “ktmdentist.com, freehostinginnepal.com, etc” Use your sense in buying domains. Here you can buy domains anywhere. If you have the hosting accounts of big companies like bluehost, godady, etc then you can easily have the unlimited domain service and run domain flipping easily but if you don’t have such facilities then there are many hosting services in Nepal that provides you the domain retailer service so Google it and you will find. So domain flipping can be the best way to earn online in Nepal.